Although only a few ingredients, this simple spinach salad is sure to satisfy. The warm bacon-flavored dressing is a nice blend of sweet and sour, combining vinegar with a little bit of sugar. The dressing is made from the resulting bacon fat, which may sound like an indulgence but it's only a few tablespoons. 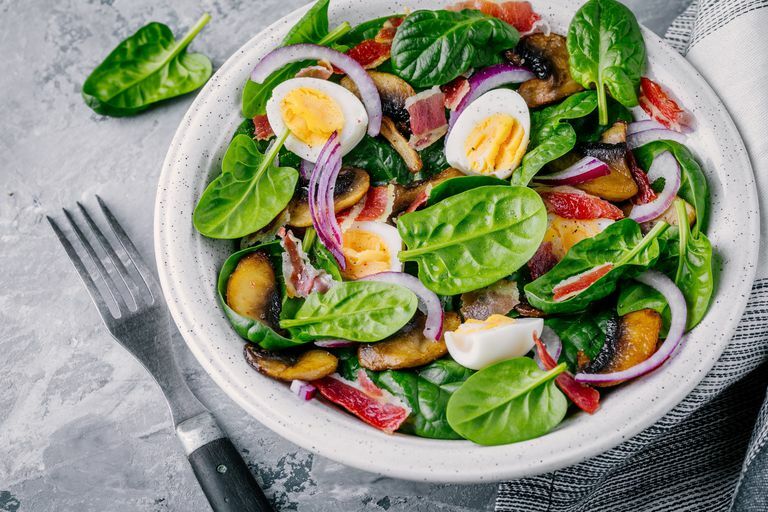 This version of the classic warm (or wilted) spinach salad can easily be made into a meal by adding chopped cooked chicken, turkey, or even fish or tofu. Chopped egg is also a classic option. If you want more vegetables, mushrooms and red pepper work especially well. Put the spinach (and other vegetables if you like) in a large bowl. The spinach will shrink down some in the hot dressing, but you need room to work. Chop the bacon and fry until crisp. Remove with slotted spoon and drain on paper towels. If you like a lightly dressed salad, leave about 2 tablespoons of the bacon fat in the pan. If you want more dressing, leave more fat and then balance it with more vinegar and a bit more sweetener later. Cook the onion in the fat for 2 to 3 minutes, and then add the garlic, cooking for 15 to 30 seconds or until it starts to become fragrant. Be careful not to brown the garlic or it will get bitter. Add the vinegar, and scrape up the brown bits in the pan. (The vinegar will seem potent, but it mellows quickly with the heat and sweetener.) Add the salt, pepper, and sweetener. Stir to dissolve, and pour the dressing over the spinach. Toss the spinach (tongs work well) until coated. Transfer to individual plates or bowls and top with the fried bacon. Add other toppings if desired. There really isn't much sweetener in this recipe, but if you decide you'd rather use a sugar substitute, just be sure to only use the equivalent amount. Stevia, for example, is much, much sweeter than sugar and therefore you only need a little bit. 1 cup of sugar is equivalent to 1 teaspoon of stevia, so for 2 teaspoons of sugar, you'd probably only need a tiny pinch of stevia. To turn this salad into a more substantial meal, you can add several other vegetables as well as a protein. Sliced mushrooms—such as crimini or shiitake—along with roasted peppers, artichoke hearts, and grilled chicken would make a delicious main dish worthy of serving to any guest.